The Savvy Girl Golf Signature Purse is the perfect travel companion. 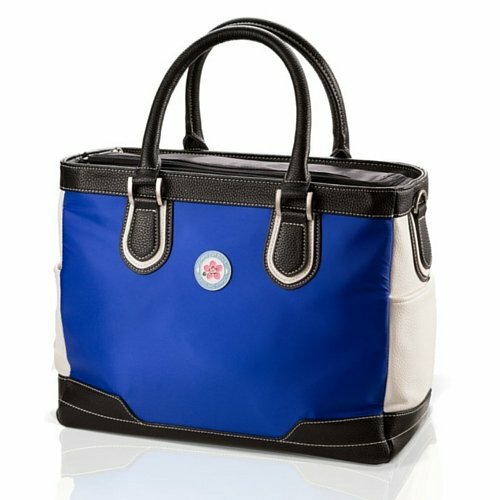 Whether you're playing a round of golf or headed to the office, its 29 pockets and unique compartment features will help you keep organized and stay fashionable no matter where the day takes you. And its interior allows for added flexible space to store your hat, clothing, or mobile devices. Crafted in durable and easy-to-clean materials, the Signature purse is the ultimate go-to handbag and features an adjustable strap for an off the shoulder or across the body look. Golfers love its multifunctional features and its ability to transform from a golf purse to a briefcase in just seconds. The elegant brushed nickel custom hardware provides a refined and stylish finishing touch. 29 multifunction pockets, clips and compartments for storing mobile and personal belongings. A top U-shaped double zipper for easy visibility and convenient access to items. A vibrant blue/black/white exterior with sophisticated rolled pebble-patterned double handles. Variable length shoulder/cross body strap also included. Interior includes an insulated beverage compartment. A cleverly hidden magnet holds included ball mark. If you have any questions about this product by Savvy Girl Golf, contact us by completing and submitting the form below. If you are looking for a specif part number, please include it with your message.